Indo-Pak relations remained critical from the beginning. There are many factors that contributed towards antagonistic bilateral relations amid both neighboring states. These factors include the annexation of Junagadh with India, the Kashmir issue, the War of 1965, Bangladesh liberation of 1971, Kargil crisis, nuclear arms race, Siachen crisis, Mumbai attacks, etc (Iftikhar, n.d.). There are many different actors that created the hype of and escalated the situation. Mass media is the component that influences the behavior and the perception of the citizen (Shendurnikar, n.d.). The conflicts have been mediatized by media actors, groups and media channels (Patel, 2005). The role of mass media cannot be ignored. The role of mass media remained very much influential in the Indo-Pak conflict. Two kinds of Journalism (i.e. Peace and War journalism) were noticed in examining the role of media in India-Pakistan relations. The Peace journalism campaign was started by the collaboration of Pakistani based “The Jang Group” and “The Times of India”, named as “Aman ki Asha” or “Hope for peace” on January 1, 2010. The objective behind launching this campaign was to facilitate “dialogue between the two governments, encouraging people-to-people contact” that would bring peace in Indo-Pak interstate relations (Shendurnikar, n.d.). Print media from both sides organized different sorts of “seminars, conferences, cultural festivals and all other forums of people to people contact” to bring peace and tolerance in the region. “Aman Ki Asha has organized literary and music fests, mushairas, editor’s conferences, trade conferences and strategic seminars to realize its vision” (Shendurnikar, n.d.). Dr. Saqib Riaz & Saadia Anwar Pasha in their article “Indo-Pak relations and Pakistani media” explained that Pakistani media is mostly plying the great role in establishing bilateral relations. But in this article the role of Indian media was missing (Riaz and Pasha, 2010). Ms. Hafsa Khalid in her article “Role of Peace Journalism in Indo-Pak Relations: A Case Study of “Aman Ki Asha” explores that the relations amid both states remained antagonistic and the global community is aware of their relations. The governments of both states remained ineffective in resolving their disputes that forced the news media to start the campaign to bring peace in the region. But this article did not illustrate the ways that were adopted by the media to bring peace in the region (Khalid, 2014). Sumera Batool, Zaeem Yasin and Tabinda Khurshid in their article titled “Comparative Study of Peace Process between Pakistan and India in The News, Daily Dawn, and The Times of India: A Case study of ‘Aman Ki Asha” effectively analyzed the media diplomacy of “Aman ki asha” (Batool, Khurshid and Yasin, 2015). The article titled “Journalism Caught in Narrow Nationalism: The India-Pakistan Media War” written by Dwaipayan Bose missed the case study of Aman ki asha program. This paper has addressed the case study of media diplomacy of the Agra summit, Mumbai attack and Kargil issue (Bose, 2011). In the article entitled “Multi-Track Diplomacy: A Positive Approach to Peace Track-By-Track Case Studies” by John W. McDonald, U.S. Ambassador, the author highlighted different types of case studies of multitracks but while assessing track nine or media diplomacy, it ignored the case study of Aman ki asha (McDonald, 2014). Media diplomacy is the pivotal element of the nation’s foreign policy (“Media Diplomacy”, 2017). “Media can help or hinder diplomacy” (“Media Diplomacy”, 2017). The function of media can be of two sorts; either it can work independently or it can follow the dictation of officials or policy makers. Many scholars defined media diplomacy. In Ebo words “media diplomacy is the use of media to articulate and promote foreign policy” (Gilboa, 2001). The process of media diplomacy initiated when any of state or both states having antagonistic relations in past are agreed to have negotiation and agreement to resolve their conflict. The actors, to start negotiation, in media diplomacy are mostly officials or the mediators. In media diplomacy the media events or activities such as conferences, seminars, interviews, dialogues, workshops, etc., are jointly arranged by the former enemies states that are having intention to transform their relations into peaceful and coexistence and reach an agreement. Media diplomacy mostly aims to resolve conflicts. Media-broker diplomacy is also the sort of media diplomacy that involves the role of “unofficial third party’ “by the news media primarily in pre-negotiation stages” (Gilboa, 2001). The role of actors differs in the aforementioned two diplomacies. In media diplomacy the journalists have to follow the directions of policymakers, however in media-broker diplomacy the journalists behave like diplomats to mediate and initiate the negotiation to reach the agreement. The antagonistic relations between India and Pakistan are evident from their inception. Both of them fought two major wars and many conflicts arose at their bilateral level relations. Media influences the mind and behavior of the peoples. Media or journalism can be either war journalism or peace journalism. The media of both states mostly played the role of war journalism that created anxiety, distrust and trouble in the mind, perception and behavior of the people of both states. However, “Aman ki Asha” is the initiative of peace journalism to bring peace and harmony in their bilateral relations. The Aman ki Asha program or campaign was initiated by the Pakistani media “Jang group” and Indian media group “The Times of India” in January 2010 to resolve the conflicts by mediation. “Aman ki asha” campaign denotes “hope for peace” that means both states desire to have peace (Khalid, 2014). Daily Jang conducted the survey about this program. The results of their survey illustrates that 65% of population of both states are aware of this campaign (Khalid, 2014). The Aman ki Asha endeavor is a broad spectrum campaign that includes every aspect of bilateral relations including; “trade, business, culture, language, education, visa policy, health issues, politics, cricket diplomacy, lifestyle, music, drama, movies or tough concerns like Siachen, war prisoners, Kashmir or water issue” (Khalid, 2014). 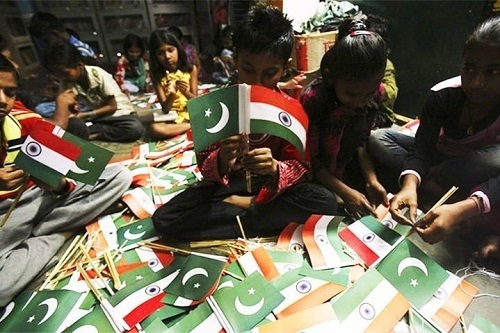 Many programs such as “Surk Shetra”, “Chotay Ustad”, “Foodistan”, and “Pakistan-India Takra” were broadcast / launched to decrease the mistrust and bring harmony amid both nations (Khalid, 2014). This endeavor provides the facility and a platform to address the many contradictory issues that pose hurdles in the peace process between both states. Aman ki asha remained successful in declining the rate of phobia of one state against the other. Pakistani phobia in India had reduced to 42% from 75% whereas Indian phobia in Pakistan has decreased to 29% from 54% due to the Aman ki Asha endeavor (Khalid, 2014). There are many critics in both nations, who criticize this endeavor as wastage of time and impractical step towards normalization of relations. Sumera Batool (et al) in their article analyzed the content of the three print media or newspaper, for example the news, Daily Dawn and “The Times of India” to find the answer of the question “which newspaper gives more coverage to the peace process between India and Pakistan?” (Batool, Khurshid and Yasin, 2015). They analyzed the news and editorial content and concluded that Pakistani print media is more peace-prone and gave more coverage to the “Aman ki Asha” endeavor. This is evident from the statistics that “the news published 301 contents, Daily Dawn published 61 and “The Times of India” printed 2018 contents” (Batool, Khurshid and Yasin, 2015). This is evident from the statistics that the coverage to Aman ki Asha is given by the newspaper. Leaders and politicians were also enthusiastic about this endeavor. Most of them are confident about this endeavor to bring peace in the region. In a meeting, PM Sharif emphasized cooperation instead of confrontation for stability and development of Pakistan and the region. Indian former PM Vajpai “said that I want to have friendly relations with every state of South Asia, it means that I want to keep relations smooth. Pakistan is welcomed to provide peace talks so that some betterment can be seen” (Batool, Khurshid and Yasin, 2015). While comparing the positive coverage of the Aman ki Asha endeavor of both states, it is noticed that 62.5% of Pakistani media gave positive coverage of this endeavor whereas Indian media only gave 37.4% positive coverage (Batool, Khurshid and Yasin, 2015). Freedom, space and liberty are the prerequisite for the media and journalism industry to follow the interests of the nation and public by/and providing valid information. In order to bring peace in the region it is recommended that the media should follow the following recommendations: A proper training and education is required for the journalist to strengthen their peacebuilding capacity. Journalists must be logical, loyal and creative towards their profession in bringing peace in the region because people’s perception is influenced by their media industry. The endeavor like Aman ki Asha must be sustained for the long term and revised after a little time to enhance the prospects of peace and decrease the phobia of one nation against the other. From the above discussion, recommendation and ramifications it is suggested that a peace oriented, unbiased, and objective role of the media is required to bring peace in the region. The media can only transform the perception of the people, so it plays an important role to bring cooperation, unity, harmony, free movement and trade; and avoid the tension, conflicts and misunderstandings. Peace journalism is the only way to resolve the historical conflicts and issues such as Kashmir, water, Siachen and border issues, etc,. and bring security, stability and development in their country and the region. Batool, S., Khurshid, T. and Yasin, Z. (2015). Comparative Study of Peace Process between Pakistan and India in The News, Daily Dawn, and The Times of India: A Case study of ‘Aman Ki Asha”. Journal of Political Studies, [online] 22(2), pp.511-527. Available at: http://pu.edu.pk/images/journal/pols/pdf-files/13%20-%20SUMERA_v22_2_wint2015.pdf. Bose, D. (2011). Journalism Caught in Narrow Nationalism: The India-Pakistan Media War. Reuters Institute for the study of journalism, [online] Reuters Institute Fellowship Paper, University of Oxford. Available at: https://reutersinstitute.politics.ox.ac.uk/sites/default/files/Journalism%20Caught%20in%20Narrow%20Nationalism%20The%20India-Pakistan%20Media%20War%E2%80%99.pdf. Iftikhar, M. (n.d.). Improving Indo-Pak ties through Cultural Diplomacy. [online] cultural diplomacy. Available at: http://www.culturaldiplomacy.org/pdf/case-studies/Mohid_Iftikhar.pdf [Accessed 6 Mar. 2017]. Khalid, M. (2014). ROLE OF PEACE JOURNALISM IN INDO-PAK RELATIONS: A CASE STUDY OF “AMAN KI ASHA”. NDU Journal (INSTITUTE FOR STRATEGIC STUDIES, RESEARCH & ANALYSIS (ISSRA), [online] pp.1-22. Available at: http://www.ndu.edu.pk/issra/issra_pub/articles/ndu-journal/NDU-Journal-2014/01-Role-of-Peace-Journalism.pdf. McDonald, J. (2014). “Multi-Track Diplomacy: A Positive Approach to Peace Track-By-Track Case Studies”. The Institute for Multi-Track Diplomacy, [online] Occasional Paper # 22. Available at: http://docplayer.net/37607967-Multi-track-diplomacy-a-positive-approach-to-peace.html. Patel, T. (2005). News Coverage and Conflict Resolution: Aid or Impediment. M.Phil. University of Queensland. Australia. Riaz, D. and Pasha, S. (2010). INDO-PAK RELATIONS AND PAKISTANI MEDIA. Margalla Papers (NDU, INSTITUTE FOR STRATEGIC STUDIES, RESEARCH & ANALYSIS (ISSRA), [online] pp.71-87. Available at: http://www.ndu.edu.pk/issra/issra_pub/articles/margalla-paper/Margalla-Papers-2010/04-Indo-Pak-Relations-and-Pakistani-Media.pdf. Shendurnikar, D. (n.d.). CONTENT ANALYSIS OF ‘AMAN KI ASHA’ – A PEACE JOURNALISM CAMPAIGN BY THE TIMES OF INDIA AND JANG GROUP, PAKISTAN. [online] Academia.edu. Available at: http://www.academia.edu/3237852/CONTENT_ANALYSIS_OF_AMAN_KI_ASHA_A_PEACE_JOURNALISM_CAMPAIGN_BY_THE_TIMES_OF_INDIA_AND_JANG_GROUP_PAKISTAN [Accessed 4 Mar. 2017].